I enjoyed reading Sipping From the Nile by Jean Naggar even though I couldn't keep track of her various relatives, all very fascinating people with long histories and connections. I kept thinking that the book really needed some family trees and charts; I only discovered that it does have them when I finished the book. They are at the end, instead of the beginning. I would have found the author's stories easier to follow if I had checked the family trees as I read. Naggar really tells the story of her family, all of the various branches and their lives and histories in Egypt. In the mid-1950's when life for Jews, even the wealthiest and most connected in Egypt becomes impossibly difficult they are forced to find a way to leave and start anew. 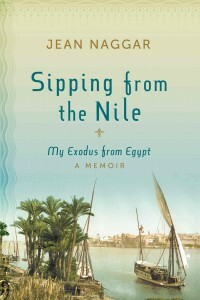 Sipping From the Nile is the second such memoir I've read in recent months. When I was in the states, I was lent a copy of The Man in the White Sharkskin Suit: A Jewish Family's Exodus from Old Cairo to the New World by Lucette Lagnado, which although takes place at the same time and has some similarities is a very different story. I wonder if the two authors know each other. Both Naggar and Lagnado grew up in large Cairo homes ruled by grandmothers and other elderly relatives. And both their mothers could only expect to run their homes when their own mother-in-law is unable. That is the custom in many parts of the world where multi-generational families/clans live together. From the perspective of their later lives in America, they feel sorry for their mothers whose roles are very different from those of a modern American wife and mother. But in the reality of that time in Egypt, in the upper class, the early married years were when the wives learned, were trained, in how to run their homes according to custom. Naggar's mother also had to contend with an older and powerful spinster sister-in-law. Just like many times in Jewish History, wealthy comfortable and well-connected Jews have trouble predicting that it's time to leave their familiar home. This happened in Germany and the rest of Europe in the 1930's, Spain in the late 1400's etc. History mavens can add more examples in the comments. Many of us are warning that even the United States, where both Naggar and Lagnado found refuge may not be the safest place for Jews in the future. In terms of finances, the USA is no longer a sure bet and the savvy are looking elsewhere for financial opportunities. Another common thread in both books is how the families deal with the illegality of transferring money out of Egypt when they are planning their moves. Both have trunks full of new clothes sewn for them to take to where in their new lives and new homes. The biggest difference is that while Loulou Lagnado's family transport the trunks from home to ever-shrinking apartments, they never open the trunks nor wear their elegant Cairo clothes, Jean Naggar's family does. By the time Lagnado's once powerful father makes it out of Egypt, he is already too old and sick to remake their lives in any semblance of their former one. In contrast, Naggar's clan reclaims their international upper-class standing in both Europe and America. Sipping From the Nile by Jean Naggar is a story of survival. It's a very powerful book. No doubt that wherever they could have gone to, they would have succeeded. Some families are like that. Yes, I do recommend reading the book, actually reading both for the contrast and hope to read Lagnado's second book, The Arrogant Years: One Girl's Search for Her Lost Youth, from Cairo to Brooklyn which concentrates on her mother's story. And when you do read Sipping From the Nile be sure to remember that you can keep checking the family trees at the end of the book to keep track of all the family ties. I review books for various magazines/papers. It's a tough call as slipshod work shows up in print. I'm sad that readers are less discriminating, let alone publishing house execs. I seek out authors who did their best (or not) and go from there. At times I'll include this line in my review "A judicious improvement of [name the type] can improve future editions of [book title]." We have friends whose family left much property behind in Egypt. They don't lack for anything today and some of them are in Israel, but just knowing that they were never compensated is annoying. Yocheved, are you referring to how they hid the charts in the back? Hadassa, only very few emigrants have been able to take all possessions and money to wherever. That's the reality. Life's A "Magic Mystery Tour"
KCC for Iyyar, Israeli Independence Day! Chodesh Tov! A New Month! The Matzah HH, KCC News and More! Simple Shade, It's Summer Already! Thank G-d, Baruch Hashem, G-d is Great! !